Good teams define themselves with December football. No hardware is awarded in December, but that is when the cream rises to the top, and teams prime themselves for championship runs. The Pittsburgh Steelers had a chance to do that on Sunday night against the Los Angeles Chargers. And for 30 minutes, Pittsburgh played the part of a team readying for a championship run. Yet, 30 minutes later, something very different happened and, when it all ended, the Steelers had lost 33-30. The hard truth behind their second half meltdown may be that Pittsburgh is simply a pretender and not a contender. Everyone knew the stakes when the action started at Heinz Field Sunday night. The Steelers held a narrow lead in the AFC North, while the red hot Chargers were chasing a Wild Card slot. And for 30 minutes, there was no doubt as to which team was stepping up. The Steelers wasted little time starting the fireworks, as Ben Roethlisberger struck Antonio Brown on a 46 yard pass that ended at the one. One play later and James Conner put Pittsburgh up by a touchdown. On Pittsburgh’s next possession, the Chargers helped the Steelers out with a blatant pass interference penalty on Ryan Switzer. Again, this set the Steelers up for another James Conner one yard touchdown plunge. The Chargers responded with a touchdown of their own, thanks to an uncalled false start penalty, but the Steelers responded with a field goal. The Steelers closed the half with another one of their trademark 2 minute drives that included a 16 yard pass to JuJu Smith-Schuster and another touchdown to Antonio Brown. On the other side of the ball, Philip Rivers was completing passes, but the Steelers defense was yielding no quarter : A sack by Terrell Edmunds, a deflected pass by Stephon Tuitt, pressure from Cam Heyward and T.J. Watt along with stout coverage by L.J. Fort led to four Chargers first half punts. The Steelers first half hadn’t been flawless. But they’d left some points on the board, but they entered the locker room holding a 23-7 lead, and those missed plays looked to be little more than footnotes as another Carolina like rout appeared to be in the making…. The LA Chargers left both Steelers coaches and amateur film reviewers with a lot of tape to dissect from the worst meltdowns in franchise history. I’ll leave it to others to dig into the root causes and adjustments that the Chargers made and that the Steelers failed to counter during the implosion. The Steelers could have put the game away with a score on their opening drive, but instead had to settle for a punt plus 5 minutes burned off the clock. The Chargers response was telling. Conventional wisdom says that when you’re 16 points behind, on the road, and you’ve only got 25 minutes left on the clock, you rollout your hurry up offense. San Diego didn’t do that. Instead, they methodically moved down the field and scored a touchdown, in a drive the consumed 8 minutes. 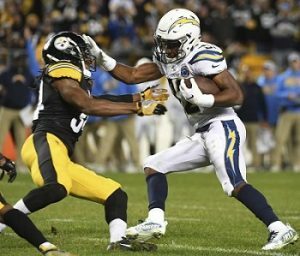 At that pace, the Chargers didn’t seem to stand a chance of mounting a comeback, even if their defense could force the Steelers to punt, as they did. But a Desmond King punt return for a touchdown changed everything for San Diego in a heartbeat. After their second successful two point conversion, the Chargers had tied the game. The Chargers responded with another touchdown to take the lead, but only after Sean Davis collided with Joe Haden taking away a near-certain Haden interception. Ben Roethlisberger rallied the Steelers for a touchdown, this time by connecting with Jaylen Sammuels, but San Diego had enough time on the clock to get in field goal position. 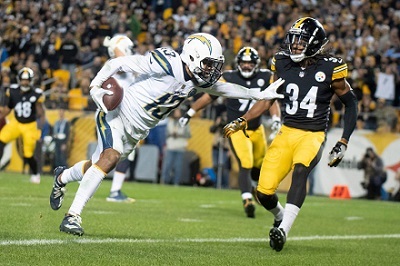 After three tries, thanks to Steelers special team penalties, the Chargers won it at the closing gun. Citing a desire not to send any more money to New York, Mike Tomlin stopped short of blaming the officials for the loss. Others have taken up his cause. Poor officiating certainly hurt the Steelers, but pointing the finger at the zebras for this loss might feel good, but it only papers over some deficiencies that Mike Tomlin and company need to address quickly. Bad calls are part of the game. Sometimes they go your way, sometimes they do not. Some bad calls have greater impact than others, but when they do occur, good teams must stay focused to overcome those. If the Steelers make two out of those three plays, they have the points they need to win the game. And all of those plays came in the first half, when the Steelers were playing well. Bad calls didn’t keep Philip Rivers clean, as Javon Hargrave’s sack seemed to be the only time the Steelers defense touched him in the 2nd half. Poor officiating also didn’t allow Justin Jackson to run rampant in the Steelers secondary throughout the second half with runs of 18, 19, 18, and 11 yards. There were any number of occasions in the 2nd half when a sack, a forced fumble, or an interception would have shifted momentum back to the Steelers. Yet, the Steelers defense failed to make a play. December football is the time when true championship contenders “lean in” towards the finish line. Against the Chargers the Steelers started by leaning in, only to trip over their own two feet. This entry was posted in Steelers 2018 Season and tagged Ben Roethlisberger, Cameron Heyward, Chris Boswell, James Conner, Javon Hargrave, Jaylen Samuels, Joe Haden, JuJu Smith-Schuster, Justin Hunter, L.J. Fort, Mike Tomlin, Pittsburgh Steelers, Ryan Switzer, Sean Davis, Steelers vs. Chargers, Stephon Tuitt, T.J. Watt, Terrell Edmunds, Vance McDonald. Bookmark the permalink.